Alongside issues arising from Concussion Mismanagement and PED Abuse, Rapid Extreme Weight Cutting practices are a tragedy waiting to happen in MMA. Today, a teachable moment arose at the UFC 171 weigh ins that regrettably was overlooked. 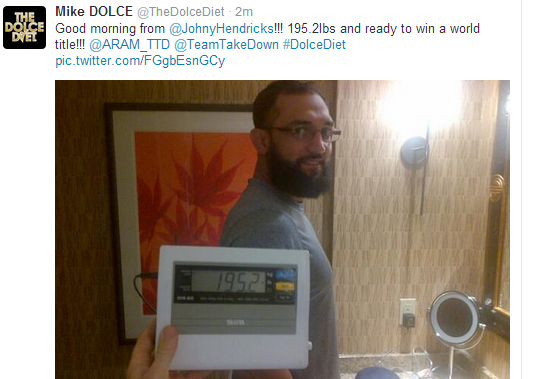 Welterweight title contender Johny Hendricks failed to make weight on his first attempt. Not only did he fall short of the 170 lbs limit but at the 34:00 mark he can be seen shaking uncontrollably and when asked by the official in charge to “stay still” he struggles to comply. Hendricks went on to cut further and ultimately made his target weight. All’s well that end’s well, right? Not necessarily. Assuming Hendricks uncontrollable shaking was a symptom of dehydration the matter should have ended at the very first weigh in. (f) If in an attempt to make weight, a contestant shows evidence of dehydration, having taken diuretics, or other drugs, or having used any other harsh modality, the department shall disqualify the contestant on the advice of the examining physician. There are two key words in the above passage, “or” and “shall”. By using the word “or” the rules of statutory interpretation make each one of the listed conditions trigger the consequence of disqualification. All that is required is that a “contestant shows evidence of dehydration“. From there the Texas Department of Licensing and Regulation “shall” disqualify the contestant. Shall leaves no discretion, it is a mandatory consequence. It may be a harsh result but the rule was presumably written with combatant safety in mind. If it was, unfortunately, this appears to be another example of a regulatory agency ignoring the safety rules that they were entrusted to apply in the world of combat sports.